For other uses, see Air Force (disambiguation) and list of air forces. The first aviation force in the world was the Aviation Militaire of the French Army formed in 1910, which eventually became L'Armée de l'Air. In 1911, during the Italo-Turkish War, Italy employed aircraft for the first time ever in the world for reconnaissance and bombing missions against Turkish positions on Libyan Territory. The Italian–Turkish war of 1911–1912 was the first in history that featured air attacks by airplanes and dirigible airships. During World War I France, Germany, Italy, the British Empire and the Ottoman Empire all possessed significant forces of bombers and fighters. World War I also saw the appearance of senior commanders who directed aerial warfare and numerous flying aces. The British Royal Air Force was the first independent air force in the world. The RAF was founded on 1 April 1918 by amalgamation the British Army's Royal Flying Corps and the Royal Naval Air Service. On establishment the RAF comprised over 20,000 aircraft, was commanded by a Chief of the Air Staff who held the rank of major-general and was governed by its own government ministry (the Air Ministry). Over the following decades most countries with any substantial military capability established their own independent air forces. The South African Air Force was formed on 1 February 1920 and the Australian Air Force was formed shortly afterwards on 31 March 1921, although it was not until 1922 that the head of the Service was titled as Chief of the Air Staff, placing him on a par with his Australian Army and Navy counterparts. The Canadian Air Force was formed at the end of World War I, and was abolished and reorganized several times between 1918 and 1924. It became the permanent Royal Canadian Air Force when it received the "Royal" title by royal proclamation on 1 April 1924. It did not however become independent of the Canadian Army until 1938 when its head was also designated as Chief of the Air Staff. Similarly, the Royal New Zealand Air Force was established in 1923 as the New Zealand Permanent Air Force but did not become independent of the New Zealand Army until 1937. Other British-influenced countries also established their own independent air forces. For example, the Royal Egyptian Air Force was created in 1937 when Egyptian military aviation was separated from Army command. Outside of the British Empire, the Finnish Air Force was established as a separate service on 4 May 1928 and the Brazilian Air Force was created in 1941. Both the United States Air Force and the Philippine Air Force were formed as a separate branches of their respective armed forces in 1947. The Israeli Air Force came into being with the State of Israel on 18 May 1948, but evolved from the pre-existing Sherut Avir (Air Service) of the Haganah paramilitary. The Japan Air Self-Defense Force was not established until 1954; in World War II Japanese military aviation had been carried out by the Army and Navy. Unlike all these countries, the Mexican Air Force remains an integral part of the Mexican Army. Germany was the first country to organize regular air attacks on enemy infrastructure with the Luftstreitkräfte. In World War I, it used its zeppelins (airships) to drop bombs on British cities. At that time, Britain did have aircraft, though her airships were less advanced than the zeppelins and were very rarely used for attacking; instead they were usually used to spy on German U-boats (submarines). By the time World War II began, planes had become much safer, faster, and more reliable. They were adopted as standard for bombing raids and taking out other aircraft because they were much faster than airships. 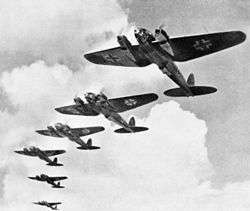 The world's largest military Air Force by the start of the Second World War in 1939 was the Soviet Red Air Force, and although much depleted, it would stage the largest air operations of WWII over the four years of combat with the German Luftwaffe. The air force's role of strategic bombing against enemy infrastructure was developed during the 1930s by the Japanese in China and by the Germans during the Spanish Civil War. This role for the bomber was perfected during World War II, during Allied "Thousand Bomber Raid" operations. The need to intercept these bombers, both during the day and at night, accelerated fighter aircraft developments. The war ended when United States Army Air Forces Boeing B-29 Superfortress bombers dropped atomic bombs on Hiroshima and Nagasaki in Japan in August 1945. The United States Air Force became an independent service in 1947. As the Cold War began, both the USAF and the Soviet Air Force built up their nuclear-capable strategic bomber forces. Several technological advances were widely introduced during this time: the jet engine; the missile; the helicopter; and inflight refueling. In 1954 the Japan Air Self-Defense Force was founded as a separate service. Previously Japan had delivered its service aviation from within its Army and Navy. During the 1960s, Canada merged the Royal Canadian Air Force with the army and the navy to form the unified Canadian Forces, with air assets divided between several commands and a green uniform for everyone. This proved very unpopular, and in 1975 Canadian aviation units were reorganized under a single organization (Air Command) with a single commander. In 2011 the Canadian Forces Air Command reverted to its pre-1960s name, the Royal Canadian Air Force. The organizational structures of air forces vary between nations: some air forces (such as the United States Air Force, the Royal Air Force) are divided into commands, groups and squadrons; others (such as the Soviet Air Force) have an Army-style organizational structure. The modern Royal Canadian Air Force uses Air Division as the formation between wings and the entire air command. Like the RAF, Canadian wings consist of squadrons. In the case of China the Air Force headquarters consists of four departments: Command, Political, Logistic, and Equipment, which mirrors the four general departments of the People's Liberation Army. Below the headquarters, Military Region Air Forces (MRAF) direct divisions (Fighter, Attack, Bomber), which in turn direct regiments and squadrons. Air Force Infantry, such as the Royal Air Force Regiment, Royal Australian Air Force Airfield Defense Guards, RNZAF Security Forces, and the US Air Force Security Forces, are used primarily for ground-based defence of air bases and other air force facilities. They also have a number of other specialist roles, including Chemical, Biological, Radiological and Nuclear (CBRN) defense, offensive operations in defense of air force assets, and training other air force personnel in basic ground defence tactics. ↑ "FINNISH AIR FORCE AIRCRAFT HISTORY TIMELINE". Pentti Perttula. 8 April 2008. Retrieved 29 August 2009.